Why not add to your enjoyment ? Take a free tour of Waverley Abbey House. Join a FREE guided tour of the beautiful first floor rooms of Waverley Abbey House. Tours will be available before the show on the Wednesday and Saturday evenings. Tours will be at 6.45pm, 7.10pm and 7.30pm and will last approximately 20 minutes. Just meet at the entrance of the house five minutes prior to each tour. No advance booking is needed – it’s first come, first served ! Owned by the uncle of Florence Nightingale, politicians and merchants over the centuries and hospital to hundreds of wounded soldiers during World War 1, Waverley Abbey House has a remarkable history. You will see how this once virtually derelict building has been restored to its former glory by the present day owners, CWR, a Christian charity. As well as offering a wide range of courses, the house today is available for hire for business meetings and private functions. 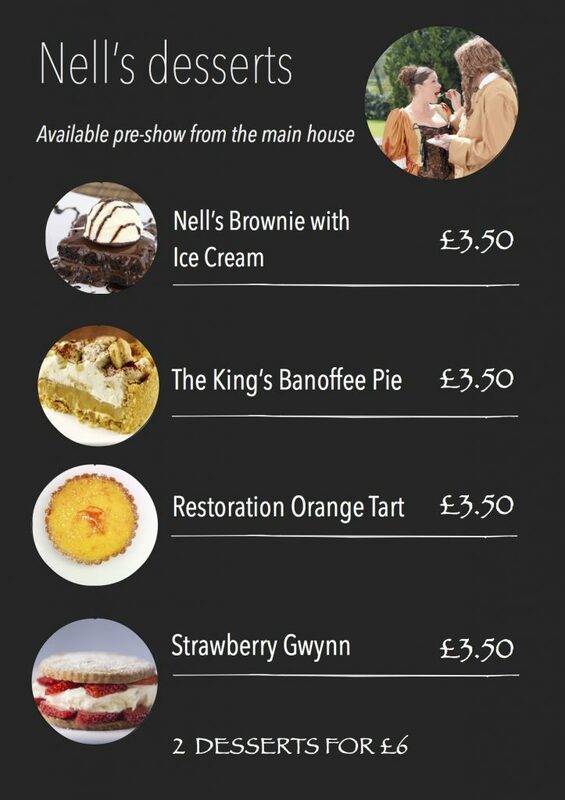 Delicious desserts are also available pre show – which one will you choose ?